Of course gluten affects people of all ages, not just children.If you are finding no resolution to your ailments, are swamped with drugs and their numerous side effects, or are just plain “sick and tired of being sick and tired” maybe you too will be grabbed by this intro to getting your health back. Go to the Free Report box in upper right corner of this website and download your free copy of The Hazards of Gluten. If you can relate to even one of those symptoms or chronic ailments (there are over 300) you or a loved one may have intolerance to gluten. 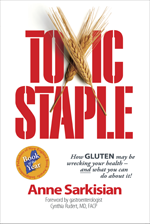 Read Toxic Staple and discover a new path toward rejuvenated health and energy, and how to track it down, if gluten is your problem. Your health is in your very own hands. You won’t believe the research and stories you will read.